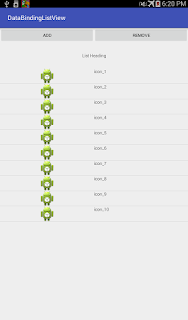 Let me assume that you have Android Studio 1.3 or later with gradle 1.5 or later. In this post we will have an example with a list of an ImageView and a TextView in each row. We will also have two buttons to add and remove items and a TextView as a heading for the ListView. The heading TextView's value, button event handler will be set using data binding. Lets start by adding data binding support for the list view heading,which is displayed using a TextView. The model class for storing the heading is a simple class with a String member variable to store the heading text and a constructor which takes the heading string as the argument. Now lets update resource file to add support for data binding. Also lets rename the created resource file name to main.xml. As you can see we have declared a variable heading of type ListHeading and used it to set the text for the TextView. Also note that we have enclosed our layout inside "layout" tag. Now lets update the activity implementation so that we set the model instance to the view. The update onCreate method is shown below. Instead of using setContentView we have used DataBindingUtil.setContentView with Activity context and the layout resource. This method returns a Binding implementation using which we can attach our model instance. Name of the class is derived from the layout file name, it will be name of the layout file suffixed with Binding. Thats it, now we should be able to see "List Heading" as the text value for the TextView. Now lets add support for data binding support for ListView. In this example we will have ImageView and a TextView for each of the list view row. Our model class will have an integer to store the image resource and a string. This class will be used for individual row of the list view. For the list view we will have another class which stores a list of the above class. Layout file for list view items. Here ListAdapter is a custom adapter. The adapter's getView method's implementation is listed below. DataBindingUtil.inflate will be used to inflate the layout resource for the listview items. Hey, very nice article. It helped me a lot. But can you make an example with an ExpandableListView and how to add new children to a group with a button click? I open your github but couldn't find calls to ListAdapter and ListBinder. Please can you explain how they function. Your code is incorrect because you are not recycling item views properly. The item layout should be inflated only when convertView is null. Your method is only applicable to a situation, that is, data is static and is ready before application's running. Am I right?